The Mackay Region has some of the most amazing nature experiences in Australia. The unique and friendly wildlife, coupled with the breathtaking beauty of national parks, beaches, islands and countryside, makes The Mackay Region a nature lover’s dream location. Take a look at some of the natural attractions you can find here. This national park is teeming with beautiful wildlife, including the friendly wallabies and kangaroos that frequent the beach each morning at sunrise, tiger blue butterflies, sand monitors and lots of marine life. Cape Hillsborough National Park is also a place to explore walking tracks, volcanic boulders and an island only accessible at low tide. Find out how to spend 48 Hours in Cape Hillsborough and the Hibiscus Coast. Explore Australia’s longest stretch of sub-tropical rainforest, with 860 plant species, 230 bird species and plenty of walking tracks. The iconic platypus can be spotted from the viewing platforms, dipping and diving within the cool waters of Broken River. Haven't used your hiking boots in a while? Read 'Why you need to tackle the Mackay Highlands Great Walk'. Explore the wonderful landscape of waterfalls, lush flora and volcanic boulders that make Finch Hatton a natural attraction. Popular walking trails include the Araluen and the Wheel of Fire Cascades where you can take a refreshing dip in the freshwater gorge. This Pioneer Valley Driving Itinerary will take you on an unforgettable 1-day roadtrip. See dugongs from the water’s edge at the dugong sanctuary in Clairview, south of Mackay. This location is also the perfect spot to drop a line and hook a fish from the beach or boat. Sweet delights, national parks, beaches, and fishing are your thing? Travel the Pacific Coast Way southbound with these great ideas for a stop. 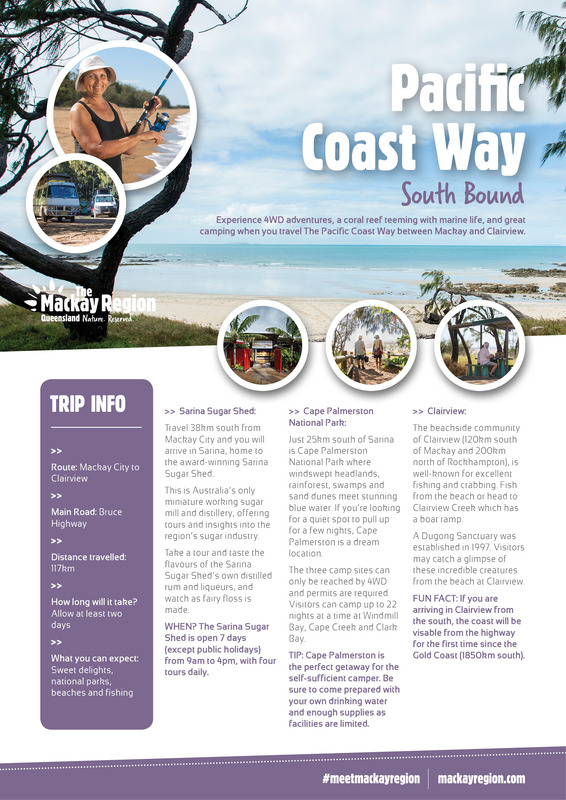 With 31 uncrowded beaches to explore, you will never be out of options in The Mackay Region. Fishing, swimming, kite boarding or stand up paddle boarding are popular sports. Did you know? Blacks Beach is Mackay's longest stretch of beach - 6KM long.